For mustache styles, head on over to my post on mustache styles. There are many beard styles in the world. I tried to catalog them all in my recent infographic 54 Facial Hair Styles. Not all beard styles, however, are recognized in professional bearding competitions. This list of beard styles are official categories in beard and mustache competitions. Use this post as inspiration if you ever decide to compete. The natural goatee is a woolly, untamed goatee that covers the chin–a style we’re all familiar with. Similar to a full beard, this beard style is allowed to grow free, with only the cheeks and sideburns shaved (and sometimes the lip). Contrary to public opinion, not all bearded fellows who sport the goatee are evil. Source: Discutivo on Flickr. Creative commons license. The Musketeer bear style combines a severely trimmed goatee with a Hungarian Mustache that is also trimmed a bit. The goatee is really a beefy extension of the chin strip, allowed to grow to a point, far past the chin. A little beard conditioner and mustache wax may be required to pull this one off. The Imperial Partial Beard style combines the mustache and beard seamlessly. It is combed up, all at once, where it is slightly coiled to point back at the face. The chin and neck are shaved clean, with only the cheeks and mustache contributing. This one only works if you have a long beard to play with until you get it juuust right. The Sideburns is a beard style that is hardly a beard at all. With a shaved chin and neck, the sideburns consists of hairy cheeks, usually trimmed to form straight hairy “runways”. Sometimes the mustache is included with Sideburns for a rather unique look. The Amish Beard is basically a full beard style, sans the mustache. Just grow your gnarly, awesome beard as long as you can, and keep your upper lip naked. They say that the Amish took to shaving their upper lips because the posh moneybags who used to oppress them wore thick, luscious mustaches. The Verdi is a shorter, groomed Garibaldi beard style, sometimes paired with an accompanying Imperial Mustache mustache style. Named after famed composer Giuseppe Verdi, the beard is shorter, neatly trimmed, combed and free of stray hairs. Only gentlemen of the greatest distinction can pull off a Verdi. The Garibaldi beard style is my personal favorite, because it is the kind I can grow most easily. Named after Italian general Giuseppe Garibaldi, this beard style is grown by round faces that have bristly, wavy or curly beards. It poofs out in a big ball. A bit of trimming here and there is required to keep the Garibaldi neat and tidy, but if done right, it can be an impressive beard that will comfort children and make single ladies swoon. As for married ladies? They just get a touch of envy and personal disappointment. The Full Beard is just a beard. Nothing fancy, nothing flamboyant. It’s just a really long, studly beard. This thing is like an extra body part. Men who sport the full beard couldn’t be rid of it any more than they could an arm or leg. The thing has a soul. When you encounter a full beard on the street, lesser beards stand aside to make way. It is the emperor of beards. The chin strip is a beard style for those who are happy being half men. Instead of sporting whatever their cheeks can supply, they whittle it down until there is very little left except a small strip right up the middle of the chin, ending at the lip. This beard style is popular with 30-year-old skateboarders with so much metal in their faces that they have to be wary of magnets. The Soul Patch works on one of two occasions. A) You’re Jack Black., or B) An enemy took a razor to your face–you had no part in the butchering of your beard. True beards provide a safety net that help collect stray crumbs. Since it collects only the smallest of crumbs from your breakfast, we can hardly call it a beard. The Chin Curtain beard style is a trimmed beard with the lip and chin shaved. The hair skirts the chin, really just dancing around the outside of your face. We recommend this style only for those who have had the fronts of their faces singed by explosive blasts. Sported by Abe Lincoln, one of the mightiest of all presidents, who apparently hunted vampires in his spare time. Just shave that upper lip, keep your beard length to a minimum and bam!—Abe Lincoln. The Mutton Chops consist of a shorn lip and chin. Mutton Chop wearers will sometimes shave their necks too, but they keep their sideburns and let their cheeks grow full with beard. Like a woman growing large with child. Ok, not really. This facial style is popular with those fond trucker caps. Kick his grass, Sea Bass. See above, add a mustache. The Franz-Josef beard style, named after Franz Josef I of Austria, starts with proud sideburns that run along across your lip. Cheeks, chin and neck are shaved clean. It looks like one continuous bushy line that skirts your upper lip but leaves the lower half of your face (the better half) bare. (The fellow above is Burnside by the way, not Josef). The Balbo stands out as an extra large goatee with a short mustache. Wear the goatee wide across your chin. The mustache is trimmed short, and sometimes it doesn’t touch the beard. Most people who sport the Balbo wear it short. The Anchor beard style looks like an anchor. Your chin and jaw make up the bottom part of the anchor, and your upper lip tops it off. Usually a stache is worn short with the Anchor, and the beard is groomed tightly and worn short. Am I missing any? And now that you’re an expert on beard styles, can you name each of them below? Greetings, fellow beardsmen! I'm a beard health expert and journalist working out of Seattle, Washington. I'm also an author, marketer, and story-teller. 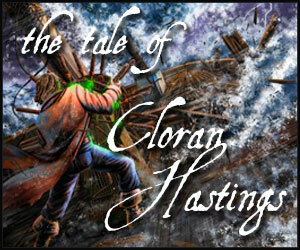 Read my swashbuckling fantasy sea adventure novel, The Tale of Cloran Hastings, and click my name to learn more about me. Enjoy the site! Well I happen to like my chin curtain as it is clean and not just sparatically sticking out all over the place. It lets me look well maintained at work while still sporting a beard. Some people just don’t respect a full beard after all. please add pictures, or drawings of the different styles. Will do. Hoped to get them up yesterday but I ran out of time. I’ll get them up tonight. Can only grow a “natural Goatee” at moment, but can’t really see it because my facial is almost platinum blonde. When it comes to blonde or very light hair, the key is to grow it out long. With more of it to see, the less likely it will be missed. Keep at it! but what I find disturbing here is that it seems like you are all posting from the future, today is september 6, 2012. or maybe it’s me living in the past? This made my entire day. Maybe even the whole week. And I don’t even have a beard. Also, including Verdi helped, since he’s my favorite. Wagner is overrated. I’m a girl lucky enough to have a husband able to sport a Full Beard. As of recent measurements it is halfway down his chest. All da other ladies be jealous, and probably some of the guys too. Woah, nice! Impressive! He should share a pic with us all. How long has he been growing it? For those that may be wondering why their beard doesn’t fit neatly into any of the categories. Beards are like the people that grow them. There is bound to be variation. I sport a full beard that has a natural parting/divide down the middle. It only became very obvious when it was grown out to (IMO) epic length past my sternum. Makes for excellent braiding material and women who love braiding or long beards cannot resist asking to touch the beard or to even braid it. Don’t be afraid to experiment. If it gets too wild or out of hand for you, you can always go back to something more manageable. Great points! If you can think of any beard styles that I’ve missed, let me know and I’ll add them. You made one small mistake…..the goatee with attached mustache is more properly called a Van Dyke, or the beard the comic book hero Green Arrow wears. Great catch! Thanks, I’ll make the change. I have a beard. it is quite feared. quickly grab a beer. were gonna go huntin dear! ps i have the wild man beard. it goes well with my lush long hair. Indeed! Sport thy bearded greatness, and accompany it with rhyme! What is my beard called? I sport it were all but my chin is shaved, like a goatee but the stache is shaved off. Hmm good question. I will have to do some research. Your site is pretty gnarly; bookmarked for sure. I finally decided to let my beard grow, as I’ve always worn a short one. This decision required a job change to allow the new growth. I’ve also found it helps to find a beard sponsor to talk you off the edge; if you get close to trimming. I still shave my neck, I just can’t get into the neck beard. Kudos to you! To each his own. I personally rather enjoy the neck beard. Thou shalt not gaze at my naked neck! That sir IS a goatee. Unless I am sadly mistaken, when you add a mustache to it, it then become known as a Van Dyke. Sadly all I can manage is The Musketeer (just doesn’t grow anywhere else) but it is nearly perfectly symmetrical; all I do is trim it off the top of the lip, but I let it hang about a half inch past my mouth on the sides. Almost time to add wax and curve out/up. Hah, probably if you’re like me, both! My goatee and moustache connect the goatee extends beyond the lip line about an inch. Is this style considered a Van Dyke? Yes, the Van Dyke is simply a goatee with a mustache attached. I didn’t include it here because the Van Dyke is not one of the categories for the World Beard & Mustache Championships. I have a very unruly curley goatee (about 2 inches) accompanied by an unattached moustache with the ends culred up with wax, similar to the muskateer but my beard is more like the natural goatee (: I’ve been growing it out since october 2013. Sounds amazing! I’d love to see a picture of it. Keep growing mate! Great questions. It sounds like you’re suffering from a patchy beard. I covered some tips on how to deal with a patchy beard in this article. Let me know how they work for you! I am 13 years old so I guess im pretty young to start getting hair? I have a near full moustache, prickly sideburns and a few prickly hairs on my chin. Most of my body is covered in dark hairs so ive concluded that my ancestors are Wookies… But does this mean anything? Could you provide me with a rough estimate on how long it will take until I can finally grow a beard, much like yourselves. Sure thing Josh. Yes, at 13, you are still very young to start growing a beard. Some men grow beards at your age, but most don’t. I would wait until I got older to start growing my beard. I have tried to grow a beard a number of times, with varying success. Currently, I am rocking a Baldo with sideburns. I work in a kitchen so I have to be very careful with hair of course. Is there any advice you could give to help keep the glorious follicles in my…well…face? You could also try using a beard wax to wax your beard down while working, to keep stray strands from getting snagged or singed. Not sure what I have, but I think it used to be a standard – at least in Victorian times. Closest is the Franz Josef, but the chops don’t go down as far. The Mustache flows into sideburns with a more seamless transition, width-wise. Bottom of the jaw is exposed all the way to the corners. I think I’ve heard it described as “Cavalry whiskers”. Is it merely a Franz Josef variation, or is there a missing category? It might be both. Have you been able to find a “Calvary Whiskers” elsewhere online? This list certainly isn’t definitive. I show off more beard styles in my infographic 54 Beard Styles. Is yours found there? Thanks. I had a look at your infographic. I guess its closer to the Souvarov, but without the handle-bar shaping. Funny thing about Souvarov himself (now that I’ve googled his image) is that he seems to be clean shaven in portraits. it might be a dumb question, but I’m 15 years old and I’m not able to grow a beard yet. I was wondering if there’s anything I can do now to make sure that I get a nice, full beard later (like food or shaving etc.)? Or am I just fully depending on my genetics? Thank you! Make sure that you are healthy. Exercise, and eat your daily allotment of protein. Only start using beard growth supplements once you are in your 20s and it still hasn’t grown in yet. I was wondering what mine would be called. I rep some nice sideburns(some may call em chops at times) and a goatee. Does not connect, still having trouble growing in middle of jawline to connect for chin strap effect. We make every effort to ensure that the items listed on this website are in stock. If an item is out of stock, check back soon--we'll either have a replacement up, or it will be back in stock.